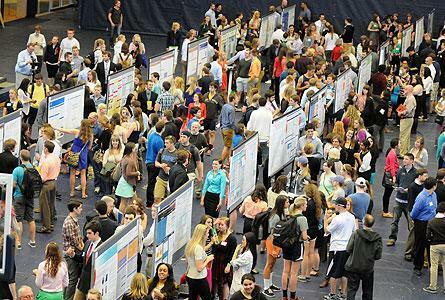 The event will feature 231 research projects conducted by 386 Hope students both independently and in collaboration with peers and faculty mentors. The presentations will feature posters illustrating the projects, with many of the students on-hand to discuss their work. The displays fill the basketball and volleyball courts and concourse of the fieldhouse. The students and their projects will represent all of the college’s academic divisions: the arts, humanities, social sciences, and natural and applied sciences. The research and performance celebration, first presented in 2001, is designed to spotlight the quality and importance of student-faculty collaborative research at Hope, a teaching model used at the college for several decades. Students throughout the college conduct original research and creative projects in collaboration with faculty mentors during both the school year and summer. The total includes more than 160 students engaging in research full-time for eight to 10 weeks each summer. Learning through research has been a teaching philosophy at the college for more than half a century. The late Dr. Gerrit Van Zyl, who taught chemistry at the college from 1923 to 1964, is widely recognized for developing research-based learning at Hope in its modern sense. More than 100 years ago, biologist Dr. Samuel O. Mast had designed research laboratory space for the college’s Van Raalte Hall, which opened in 1903. Hope has received recognition in a variety of ways through the years for its success in teaching through collaborative faculty-student research, and for the high quality of the research itself. Based on the college’s proven history of excellence, the Washington, D.C.-based Council on Undergraduate Research (CUR) chose Hope to present the national webinar “Transformational Learning through Undergraduate Research and Creative Performance” in April 2011. For the past 13 years, since the category debuted, the “America’s Best Colleges” guide published by “U.S. News and World Report” has included Hope on its listing of institutions that are exceptional for their emphasis on undergraduate research and creative projects. Hope is one of only 32 institutions of all types, and one of only seven national liberal arts colleges, on the list in the 2015 edition. The fieldhouse is located at 222 Fairbanks Ave., at Fairbanks Avenue between Ninth and 11th streets.